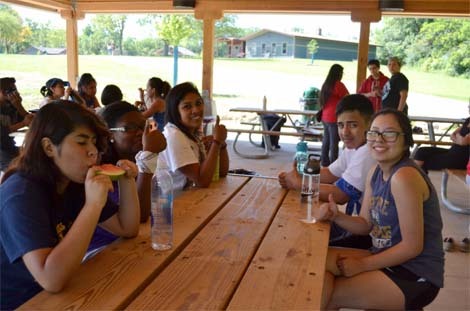 Teens with Mujeres Latinas en Accion enjoyed a full day and night outside at Camp Sullivan. of the teens had never been camping before. “The program offered a new kind of experience that many teens were excited to participate in. Disconnected from any technnology…teens gained hands-on experience setting up their own tents, preparing their own meals, hiking, playing community building and outdoor recreational activities, stargazing, and a night campfire,” says Maritza Rocha, Director of Youth Programs. With support from the Foundation, the group’s leaders went through an overnight training experience to learn the in’s and out’s of camping — and of guiding a youth group through its own experience. “I met and learned alongside phenomenal youth leaders from all throughout Chicago as part of the CLIC group. This experience made camping with my youth team and teens enjoyable, adventurous, and unforgettable since I was able to rely on the knowledge I had gained through my training,” says Judy Idrovo. This year the Foundation granted $100,000 to the Forest Preserves of Cook County’s first year of public camping opportunities at its newly created or redesigned sites across the County. Specifically, the Foundation directed its support to make the joys of camping accessible to those who have never tried it before – through gear rental, skills training, and guided campground activities. Hi, love your article! It’s great to let the kids go on their first camping trip. They probably enjoyed it a lot. Good learning experience for them about surviving in the outdoors.